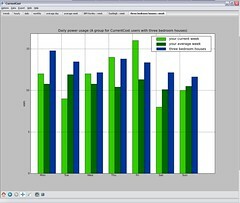 I’ve played with ways that CurrentCost users could compare their usage with their friends for a while. But now I want to see how it will cope with a bigger group of users. Want to join in? I’ve started writing some instructions – please do give it a try! Update: I figure that if I’m asking for people to help me, then it’s only fair that I give something back. So I’ve made available the Python source that reads and parses CurrentCost updates. This entry was posted on Tuesday, October 14th, 2008 at 8:31 pm and is filed under tech. You can follow any responses to this entry through the RSS 2.0 feed. Both comments and pings are currently closed.